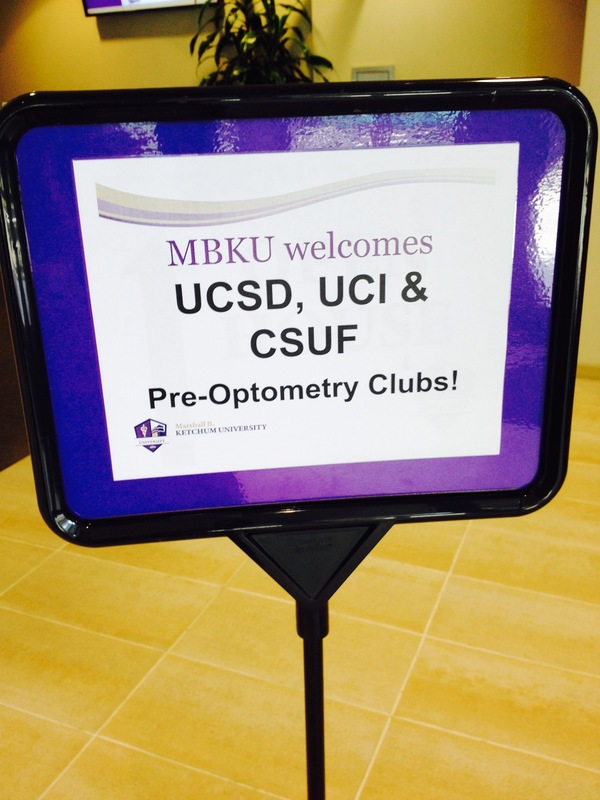 Pre-optometry Clubs are treated to a day at MBKU! 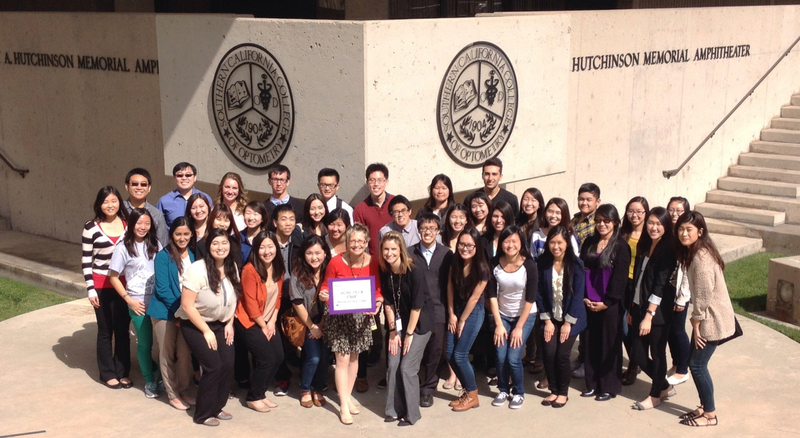 Last Saturday, 36 students from 3 different university pre-optometry clubs (UCI, UCSD, and CSUF) gathered at Marshall B. Ketchum University to learn about SCCO and its optometry program—especially its clinical facilities. Like any other campus visit designed for a pre-optometry club, they toured the campus, heard lectures about the school, received tips from faculty about the interview process, and enjoyed lunch with current students who answered their questions about what it’s like to be a student in the optometry program. 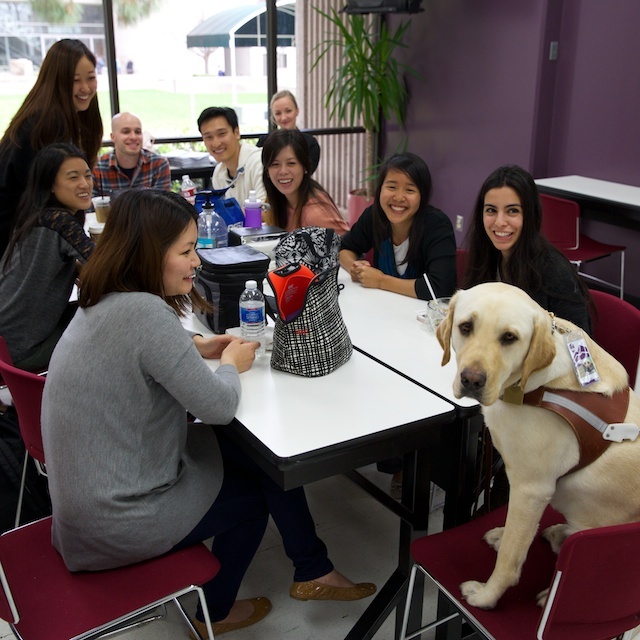 Typically, a pre-optometry club visit does not focus on any one optometric specialty; however, these students were treated to a unique inside-peek into the University Eye Center’s (UEC) Low Vision Rehabilitation department. Wayne Heidle, Assistant Professor & Adaptive Technology Specialist for the UEC’s Mary Ann Keverline Walls Low Vision Center, gave an inspiring lecture detailing the issues affecting a partially sighted or blind individual and the impact that low vision technologies can have on a person’s quality of life. Then he discovered the Low Vision Rehabilitation Center at SCCO and everything changed. This center is designed for patients who, even with the best vision correction, still do not have functional vision—they need specialized help that normal eyeglasses and contact lenses do not provide. 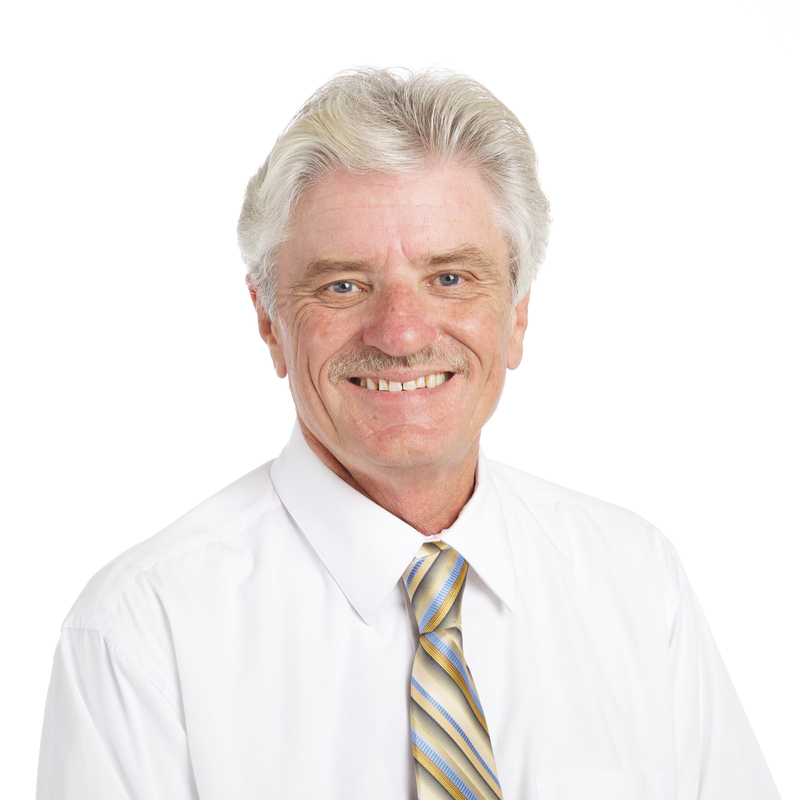 As a low vision patient, he was helped with adaptive technology that allowed him to remain an active participant in not only his personal life, but also his professional life as well. For Mr. Heidle and his particular condition, he benefitted from a large screen TV that functioned as a computer desktop-screen monitor. Poncho has his own MBKU ID Badge! Many years later, he went from being a patient to a volunteer. He is now an assistant professor in that very same Low Vision Rehabilitation Center. 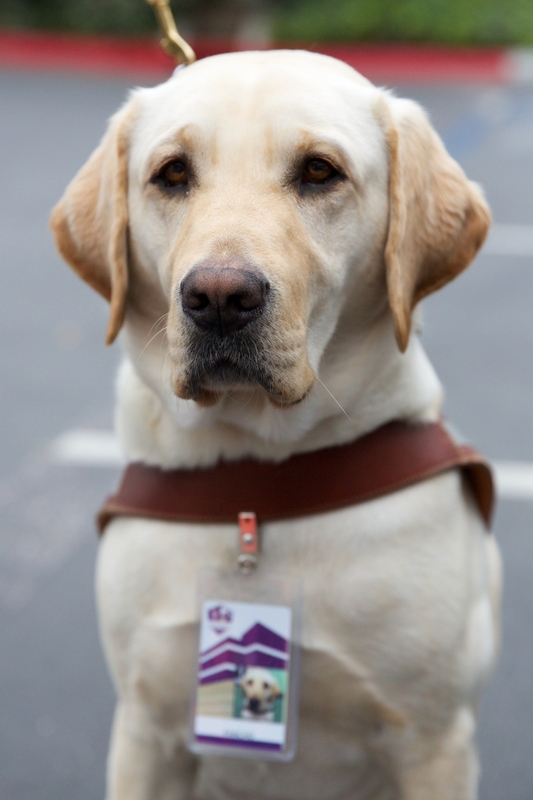 With the help of his guide-dog, his yellow Labrador retriever, Poncho, Mr. Heidle and his team help find the appropriate technology for other partially-sighted patients, allowing them to live their lives to the fullest. Mr. Heidle refers to the Adaptive Technology demonstration room as “A Room of Hope.” For patients who are seen for the first time, he explains that most have lost hope in being active participants in their own futures. In their first visit, he can get their hope back on track just by demonstrating some of the technology available. For both Mr. Heidle and the patients he works with, these low vision devices make a significant impact: closed-circuit digital cameras and magnifiers may allow a patient to read a book or a label at the grocery store, create art or photography, or view forgotten pictures of loved ones. These are activities that most of us take for granted, but are so precious to these partially-sighted patients. 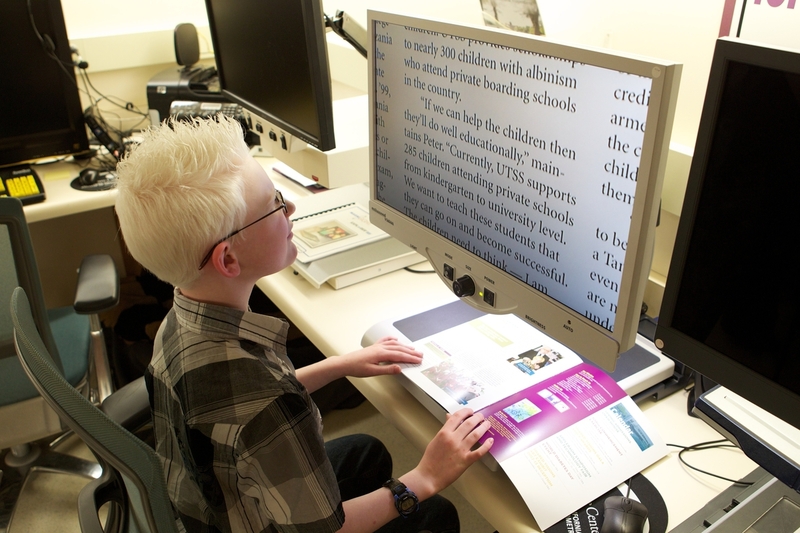 Some computer programs even allow for scanning a hard-copy document, and bypassing the need for ordinary vision, allow the patient to zoom-in on them or even have them read aloud by the device. “Thank you so much for your kind words. Optometry does make a huge difference in the Blind and Visual Impaired Community and it is my mission to make sure that future Doctors of Optometry understand how much of a difference they can make. 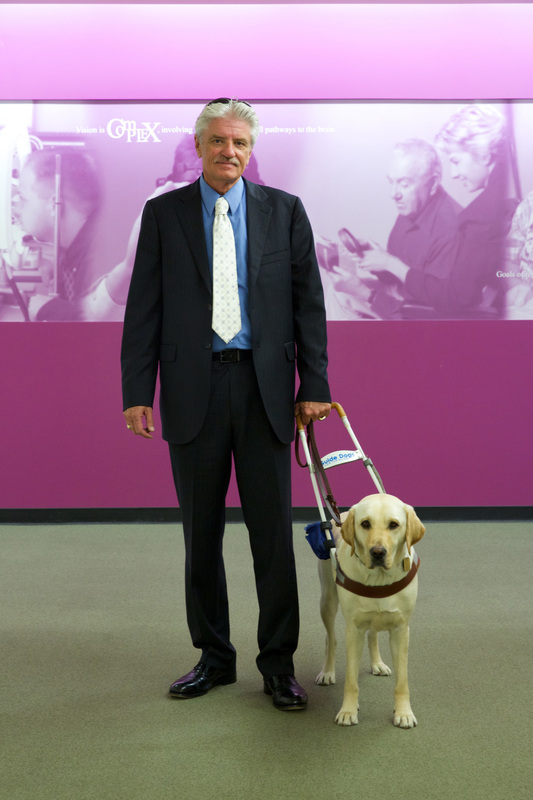 Marshall B. Ketchum University transformed my life as a visually impaired person and at the same time, transformed the lives of many of my visually impaired friends. By finding this University as a patient and then being accepted into the Low Vision Clinic and Low Vision Course is the highlight of my life. Many of our graduates are making a difference nationwide and also making a difference in the associated communities for the Blind and Visually Impaired. Optometry is a profession that takes pride in its unique ability to help low vision patients. SCCO takes pride in its expert provision of this care through people like Mr. Heidle and the Mary Ann Keverline Walls Low Vision Center. Speaking on behalf of the University, the Admissions team here at SCCO was more than happy to share this day with these pre-optometry students. We hope that each one left with a better understanding of the unique role that optometrists have the potential to play in the visual needs of patients with low vision. For more information, please visit a webpage dedicated to low vision at UEC website or Mr. Heidle’s website devoted to low vision and blindness prevention charities. Here’s the Doc 2 Doc flyer with an article on the topic of Low Vision Rehabilitation and the services offered at the UEC.